I came across this picture in this week’s Times Literary Supplement as part of an article describing an exhibition currently showing at the National Gallery in London. I thought I’d share it here because it’s such an extraordinarily powerful and mysterious image. It was painted sometime around 1512-16 by Sebastiano del Piombo, a contemporary of Michelangelo. The Pietà (an image of the distraught Virgin Mary lamenting the death of her son, usually cradling his lifeless body) is a familiar subject in religious art, but this particular version is strikingly different. For one thing, the Virgin Mary is not holding, or even looking at, the body of Christ. She seems instead to be lost in prayer. For another, the figure of Mary towers over the corpse at her feet. Is it just me, or does she look rather masculine too? Assuming this is deliberate, are we seeing her somehow growing in stature, perhaps becoming divine herself? It’s as if we catch her in the moment in which she is undergoing some form of transformation. In any case she’s not simply overcome with grief as in many depictions of this scene. What she is experiencing remains an enigma. This is not unusual for Renaissance art: paintings in particular often seem to contain secret messages. The body of her son – brown and apparently without wounds – looks grotesquely stiff, incapable of being embraced. The background is a bleak landscape of ruined buildings and stunted trees, feebly lit by the distant moon. 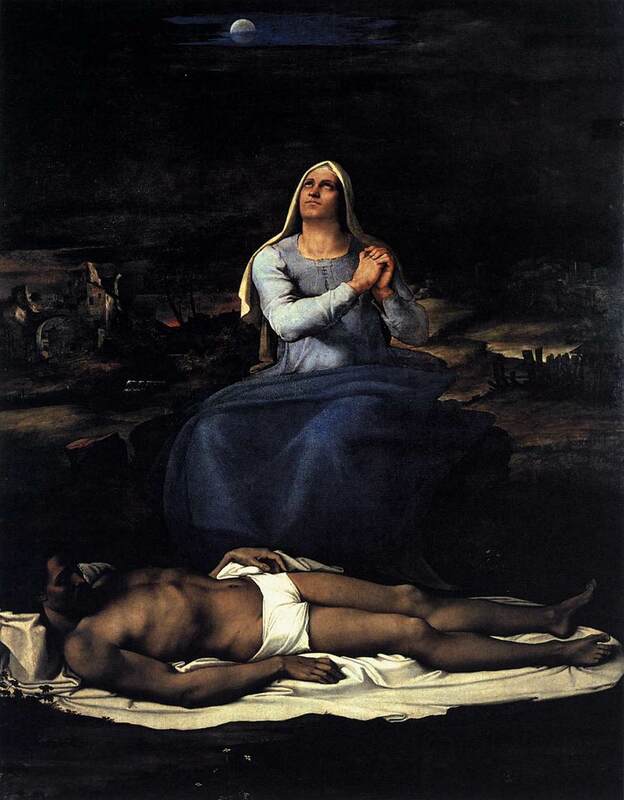 It’s a stark, comfortless description of the dead Christ, but Mary embodies a sense of determination and hope. Above all, though, it’s a very dramatic painting.